We have a delightful candy store in our town. 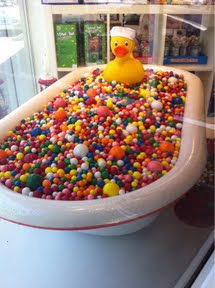 In the window is a big claw foot bath tub full of all sizes of bubble gum, all colors! Inside are glass bins full of candy, lots of candy. All of it is sold by the pound. Gloves and bags are handed out to all the customers and everyone is allowed to go to whatever bag they desire and fill their bag with whatever candy they desire. As you may be able to imagine, I like this store. My children find this store rather delightful as well. The store is nostalgic. Its colorful. It smells good. It's fun. I like the idea of going back and taking a friend. I like to tell others about it. It stirs up a passion in me, and I have to ask myself, am I this passionate about other things, like church, for example? Do I want to invite my friends to church? Tell them all about last weeks experience? Am I excited to go back? Does it stir a passion in me because I meet Jesus there? Do I think about my experience there through out the week? Are my children delighted to be there? Does my experience there create color and joy in my life? Jesus, You are all of those things, how can I incorporate that into my church experience every week? Be in my church, Jesus, in my relationships, in my life and soul! Say that Again Jesus, You are all things and You are real, and You will be In all places with a passion!